it haz bin a nasty coupla daze in the B.R. mommie gotted the flu and da B.R. luked like a sploshun in the used tishew factory. mommie hadded da fever fur 48 hours so i wuz on doody to keep mommie warm and make her stay in bed. she did not git out of bed, except to use da catbox, fur 2 daze. today mommie gotted up cause she had to go see da hooman vet and git sum medacines. mommie says i wuz the bestest nurse efur. i do not like it when mommie is sick cuz we did not git to snoogle cause mommie's noze kept sploding. dis iz a tree outside mommie werk. she thot the colors were purrty. 1. What color is your collar? I have a pink collar wif a together tag on it. it iz furry gurlie lukin. 2. What kind of food do you eat? i eat my i yam kibble, original vishus lamb flavor or chick-hen wif begatables. tuscan chick-hen wif wild rice and greens. 3. What are your favorite treats? 4. Do you have a Valentine or significant other? Noooooooo..but I am available! but i have a fing fur tabby men, like angus and chase. 5. Do you get table scraps? 8. How many times a day do you eat? The dry food stays down all the time..i nibble about five times a day but i do not eat too much, i yam a laydee and i need to watch my figure. i luf green, the color of my blankies. well, it iz cold here in da mornings now. usally, da sun comes out later in da day but only fur a short time. it haz severly cut into the furtanning skedule. mommie and da pool side crew haz had to move happy hour into da lodge here on friday and dey play dominos in da lodge while they have drinkie poos. 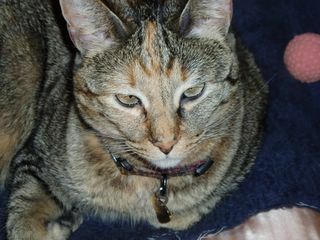 mommie has been having alot of bored stuff too and werkie haz bin buzy and she iz fighting off germs at werk. she iz furry carefully not to bring any germs home to me and she warshes her hand when she comes into the house frum outside so i do not git any piggie germs.